Currently the only way to take a photo using the iPhone’s camera is by pressing the camera icon at the bottom of the screen. Many people find this annoying and uncomfortable, especially if you’re taking a photo of yourself using the front VGA camera on the iPhone 4 or 4S. Many smartphone (Android, BlackBerries) have their own special button for the camera and as we know, non of the iPhone models have a button specifically for the camera. Fortunately, there’s a jailbreak app available in Cydia called SnapTap that allows the iPhone’s camera to take pictures using the volumes controls. You can use the volume buttons found in the iPhone or the buttons in the wired headset to take photo. This tweaks allows you to capture videos with the iPhone build-in camera app and it even works on third-party iPhone camera apps from the App Store. Take photos easily by using the iPhone’s volume controls and the wired headset button. The best thing about this tweak is that it won’t create any additional icon on the phone home screen and it works straight in the iPhone build-in camera app. Instead it just creates a settings for SnapTap in settings.app. 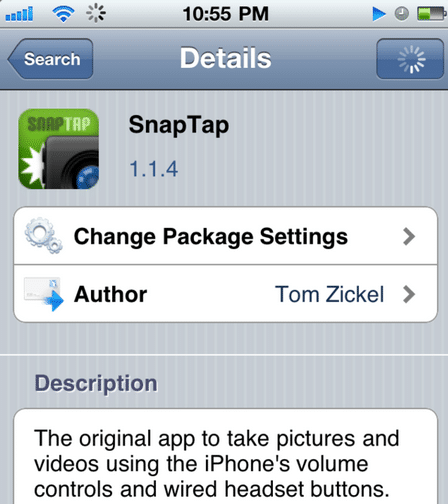 You can find SnapTap in Cydia default repo BigBoss for a price of $0.99.